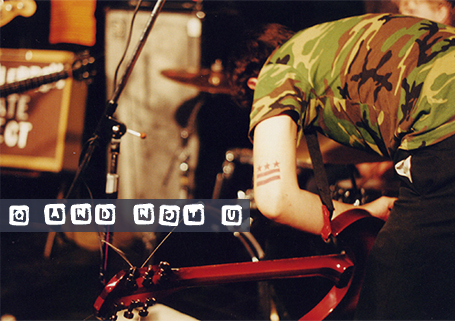 Q And Not U began to form in the summer of 1998 as John Davis' other band, Corm, began to fold. Corm's guitarist had left the band but the remaining members wanted to tour one last time before hanging it up, at which point Chris Richards entered the picture. "He would be at Corm shows and we had played a couple of shows with his other band, the Tildon Shirtwaist Fire, so Chris ended up playing guitar for us," explains Davis. At that point, however, it was too late to salvage the band or the tour and Corm disbanded, leaving Davis and Richards to work on a new project. "We had the idea that it would be sort of like a weird little thing where we would make a demo tape, go out and tour with that tape and then break up at the end of the summer. We did that, but we stuck around a little longer than we had originally intended, about a year." Their new project happened upon one of the hardest things to find in punk rock, good fortune. "We happened to play a show that we got a lot of money for, so we ended up putting out an album." That band, the Elusive, did eventually dissolve as planned, leaving Davis and Richards back at the preverbal square one. Richards began playing with Matt Borlik, an old high school friend from Annapolis, Maryland, and the two soon realized that they would need a drummer to complete the set up. Davis, a six-stringer by trade, decided that anything was better than sitting on his musical laurels and jumped in behind the traps. From there, everything began falling into place. "We liked what we were doing," says Davis, "and Chris knew Harris, whos band had just broken up, so he asked him to come play with us and after a few months we had some songs together." The foursome played their first show in November of 1998 and have continued on since as Q and Not U, having passed on such names as Latin for Amplifiers. The name is something Davis explains easily enough; "Well, there really are no words in the English language that have a Q without being followed by a U. Q and Not U is something that is hard to find, which we sort of found interesting." Almost exactly two years after their first practices Q and Not U find themselves preparing for the release of their freshman full length on their hometown label Dischord, the standard bearer for post-punk rock and roll. The matchup between band and label is one that is seemingly obvious, seamless, the band being products of an indie rock culture that the label almost single handed spawned. Davis agrees that the connection is elementary. "We all grew up in the DC area, so it is pretty standard that we all grew up with Dischord. I got into punk rock about nine years ago, when I was fourteen, and I know all of the other guys got into it around the same time. We were all into Fugazi, Jawbox, Shudder To Think. I really liked the Holy Rollers, Hoover and all of those bands. Along the way, I mean I was in Corm since 1990, when I was in the eighth grade, and any time we made a tape or anything I would send it to Dischord. I remember when I was still pretty young, one time Ian wrote me back on a postcard and said that he liked the tape and that I should keep sending him stuff and keep him informed with what was going on. That was really amazing, because we really loved these bands and they were one-hundred percent accessible. You hear it a million times, but before that we were listening to big rock bands who weren't't like that. I guess I met Ian [Mackaye] back in 1993, and he helped out a lot with Corm and we used to do split releases with Dischord and my old record label, Shute." Eventually the ties that Davis had forged with Mackaye and his label would come back around when Q and Not U began to blossom. "We were playing shows and at first we really weren't ready to record, but after seven or eight months together Ian was at one of our shows and he seemed to really like it and later he agreed to record us." The fruit of that labor was the "Hot and Informed" single, a split release with Dischord and DeSoto that garnered positive press all around. This past summer the band took the energy from their single and headed out on the road several times, having shed their green skins. "We did about two weeks by ourselves where we played almost all new places, and that went pretty well," Davis reports. "The second time we went out was with Engine Down for eleven days, and that was really fun because it was the first time we had gone out for any length of time with another band. It was helpful because we got to play for people who may not have come out if it was just us, and we played new places every night. The only city we'd even been to before was Richmond." On the road Q and Not U tries to maintain the punk rock ethics they absorbed growing up in DC, playing all-ages venues almost exclusively, their resolve easily fueled by the memories of "being shut out of shows when we weren't 18, which wasn't even that long ago. Sometimes we have to play shows that are 18 and over or 21 and over, because there just isn't another option, but we try to set up all ages shows as much as possible because we obviously want to play for everybody and we know what it is like to be turned away." As I comment on the relative lack of punk rock ethics in punk rock today, Davis agrees with a reserved acceptance. "Well, things are always changing and it would be nice if the bands that got big stuck to their guns, or if they were even concerned with it to begin with. But some times it just doesn't work that way. Growing up in DC kind of spoils you because everything here is all ages. In the end it is up to the individual bands and I can understand that sometimes club shows are just better than all-ages shows." The all-ages debate is not the only politics behind Q and Not U, by a long shot, but unlike their big brothers that they remind so much of, the band refuses to take up any idealistic gauntlets, at least outside of their music. "I try not to call our band anything, outside of maybe saying that we're a punk band. When we started playing we wanted to be really sure that our actions spoke for us, rather than taking any obvious stances on anything," Davis elaborated. Perhaps even better known as the man behind Held Like Sound, Davis is all to familiar with the trappings of overt messages in rock music and avoids making all the mistakes he sees through a magazine editor's eyes with his own bands. "Doing press stuff you read bios and one-sheets that completely lay out everything the band is about, which I think discredits the listener. And it also seems a little self-important. We just try to live our lives in a way we feel is responsible, and we do care about what is going on, but it doesn't mean that our politics have to be our identities. If someone were to say we were a political band from reading the lyrics, I couldn't say that they were wrong. But I wouldn't really say anything." It appears that the political arena is only one place in which Q and Not U breaks from the punk rock mold when Davis admits to following college basketball (specifically his alma mater, Maryland University), which was recently shaken up by the firing of its politically INcorrect king. Where politics are quick to shut him up, Davis was at ease to talk at length about the subject of Indiana University Men's coach Bobby Knight. "I was reading about [Knight's firing for several incidents of assaulting students] today and, although it doesn't really bother me, it just seems like it is about time. He's been engaging in this behavior forever and he is glaringly arrogant. But at the same time I do kind of like the fact that he is a bit of a throwback, and it is always good to keep a little bit of the past around, but I do think he went too far. I love sports and I know that he is passionate about his sport, but it really seems like he was drunk on his own power, and the school was letting him get away with it. The funny thing is that there was a near riot on the campus because all of the students were freaking out about it. I don't know if I understand that. But the guy has been coaching for thirty years and Indiana really hasn't advanced anywhere in the NCAA tournament in the last ten." Davis' anti-rocker stance on sports is apparently no anomaly, but rather representation of another facet of the DC rock scene. "Around here [sports] are great. We have a pickup softball game every week during the summer, and we play street hockey almost every weekend. Guys from my band, from Oswego - that's like the new Kerosene 454 band, people from American Workplace, Drew from Bald Rapunzel. It's all pretty much rock and rollers that are playing. Ian and Joe from Fugazi, Kim and Bill from Jawbox play, Mike from Shudder to Think, they all play softball. It's definitely a rock and roll scene here, and it is weird how sports became so demonized within punk rock because, to me, it is just fun to get out and play and have a little competition." I relay the stereotypical story of the dreaded Varsity wrestler, which Davis acknowledges. "I remember what it was like, being in high school, but I didn't really have to deal with that too much. But that is the classic punk thing, where the jocks would beat up the punks. But I grew up here in DC when punk was the most accessible it has ever been, and the years that I would have been messed with was when everyone was wearing flannel. I started high school the year before Nirvana broke. Maybe that's why I emerged unscathed." Indeed, whether protecting them from big dumb jocks, instilling them with an enduring ethic or inspiring and nurturing their spastic brand of experimental post-punk aural brawling, the District of Columbia has stood by Davis and his band mates, delivering them back to Dischord to record their first full length, due out this month. "When it came time to do the full length we knew we wanted to record with Ian again," says Davis. "We asked him and he offered to put it out on Dischord." 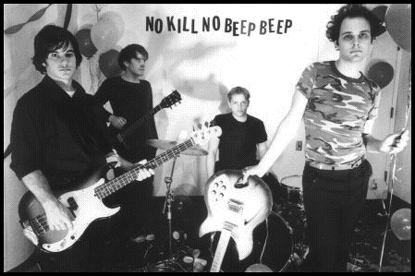 When Dischord #123 comes out, it is sure to raise eyebrows and turn heads again toward DC, not only with its characteristically off-kilter title, No Kill No Beep Beep, but with its invigorating sound and creative drive, something their hometown has been slow about in recent years. Davis assures us that his band is not leading any kind of capital city rock revival. "DC has always been a kind of ebb and flow city. I've read interviews and I've done interviews and that question is always asked - 'what is DC like right now' - because it is always so up and down. Right now, it feels like things are on the up swing, but that could be because I'm in an active band. We still have the bands that are always pretty active, like Fugazi, the Dismemberment Plan, Burning Airlines and Bluetip, but there are also some smaller bands that are just getting started. The other night I saw a band called the American Workplace and I thought they were really good. There's also a band called Calibos that is really good. There are a lot of bands right now and it depends on who sticks together and sticks around." Davis, and Q and Not U as a whole, belie their onstage energy and genius with a real-life subdued optimism, their nonchalance putting off the panic that is sure to break in the wake of their maturity. "We're kind of in the middle, in that we're not one of the bigger bands but we've been around for a while and toured and some people know who we are." As bright as their future seems, Q and Not U are taking it at their own speed, keeping their heads clear and their expressions focused. "We're going to kind of take it easy this fall while Chris is finishing school, just playing some regional shows. When Chris is done in December he is finished with school for good." Their previous road experiences have undoubtedly proved as learning experiences. "We went out on tour last January and we kind of realized that we didn't want to do that again. [Laughing] It wasn't terrible, but you can only freeze for so long. But we don't want to wait too long after the record comes out, so we'll probably tour the US in late winter, like February or March. Hopefully we won't get stuck in too much bad weather. Until then we're kind of laying low, getting into our new practice space. There are a lot of things we want to do, some compilation records and EPs for different labels, and we just need to get some songs together for that. We really feel like we've reached a juncture with what we're doing. We've kind of been following the same path for a while, since we started, and we'd really like to change things around. I think we're just going to get in the space and mess around with everything and hopefully everyone will have an open mind about what we're doing. We've been tossing around some ideas. We don't want to be governed by the fact that we have van payments and a record coming out. We don't want to operate the band on those bases. We want to make music that we feel happy doing, so we're going to wait out the winter and then get started with a tour in the spring, then start working on new songs." When Q and Not U is ready, the world will be here, waiting. In the meantime, if you need more Q and Not U information to fix your craving, check out a short Q & A about random (and we mean random) stuff with John Davis here. Additionally, you can find five images of Q And Not U here and another feature article and live review at here.